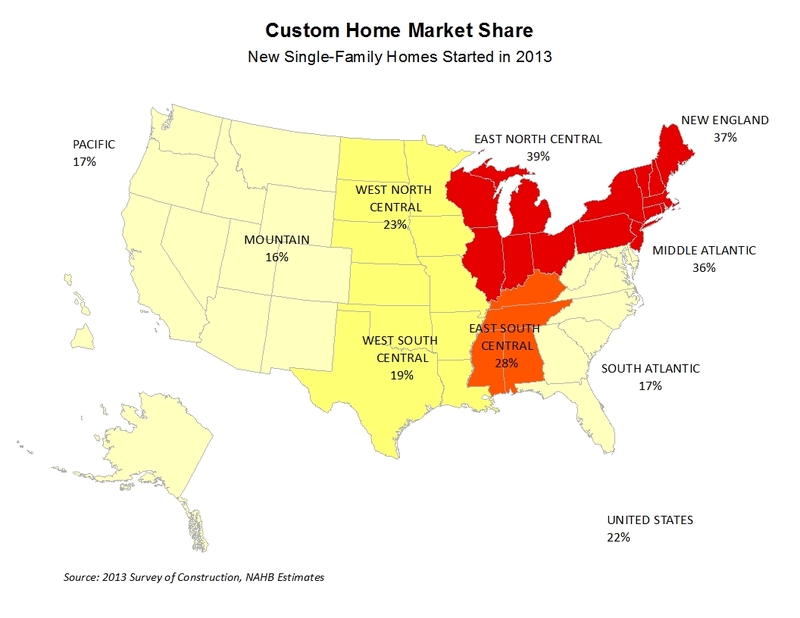 New NAHB research reveals significant regional differences in the share of custom homes started in 2013. The analysis finds that the Northeast and East North Central parts of the nation have the highest market shares. The new findings come from analysis of the 2013 Census Bureau’s Survey of Construction (SOC). The SOC differentiates between houses built for sale, houses built by contractors, owners and for rent. Built for sale, or spec houses, are houses built on builder’s land with the intention of selling the house and land in one transaction. Contractor-built or owner-built houses – that together make up the custom home market – are built for owner occupancy on owner’s land with either the owner or a builder acting as the general contractor. During the recent housing contraction the share of spec starts declined from 79 percent in 2005 to less than 65 percent in 2010, most likely as a result of the severe lack of Acquisition, Development, and Construction (AD&C) credit. The trend finally reversed itself in 2011 and the share of spec starts reached 74 percent in 2013. 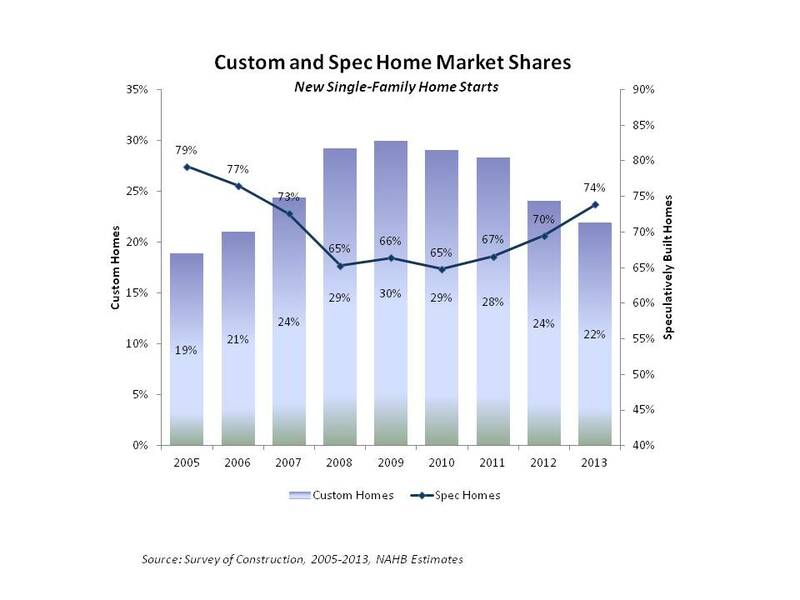 At the same time the share of custom homes increased from less than 20 percent in 2005 to 30 percent in 2009. It has been declining since then and went slightly below 22 percent in 2013. Even though most homes started in 2013 are built for sale, the share varies widely across the United States. The Western divisions – Mountain and Pacific – register two of the highest shares – close to 83 and 80 percent, respectively. In the Northeast (New England and Middle Atlantic) and East North Central divisions, less than 60 percent of all single-family starts are homes built for sale. Rather, these divisions register the highest shares of starts supervised by contractors or owners – close to 39 percent in the East North Central division, 37 percent in New England and 36 percent in Middle Atlantic. The East South Central division stands out for having the highest share of homes started for rent, close to 10 percent, more than double the national average of 4 percent. Nationally, 59 percent of single-family homes started in 2013 are built in community associations. Most of these homes, close to 90 percent, are homes built for sale, so it is not surprising that shares of speculatively-built homes and homes built in community associations are highly correlated across the United States. The two divisions that report the highest shares of for sale starts – the Mountain and South Atlantic divisions – also report the highest shares of starts in community associations – 78 and 73 percent respectively. And the two Northeast divisions – New England and Middle Atlantic – simultaneously report some of the lowest shares of speculative starts and the lowest shares of new starts in community associations, 23 and 32 percent, respectively. ‹ Where are Sale and Contract Prices per Square Foot Highest? Do you have related data on if these homes are appearing in master-planned communities or not? Interesting report. For this analysis we rely on the Census Bureau data and they does not use the “master-planned communities” term but rather only refer to community or homeowner’s associations. It is hard to judge how closely these communities overlap and track each other. Is this the latest info available for custom home markets? Are there any reports for 2014? We plan to update this information in August/September. Thank you for your interest in our research!